Save the date! 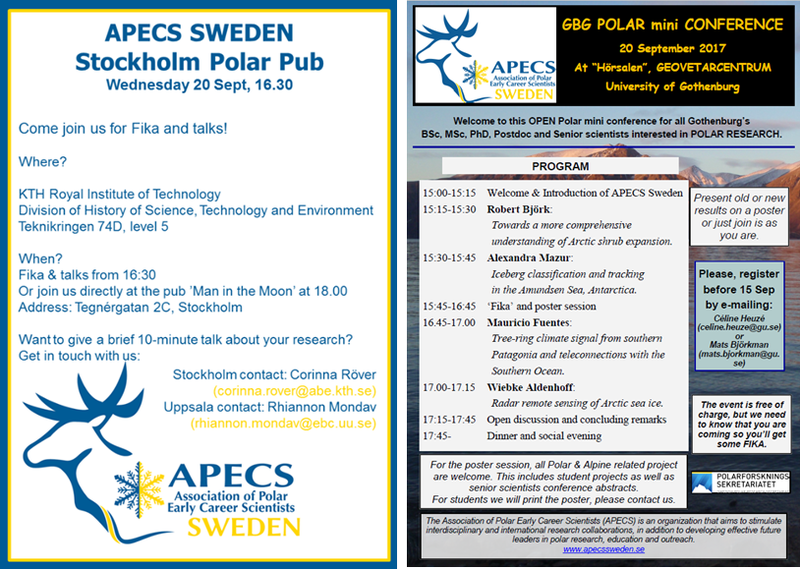 On Wednesday 20th September, there will be an APECS Sweden event on each coast! The concept? Two short talks by volunteers, then social evening at the pub. If you want to volunteer, contact Corinna or Rhiannon. Uppsala people, APECS Sweden pays for your travel to Stockholm if you want to attend. Wiebke Aldenhoff, Radar remote sensing of Arctic sea ice. 20th September, starting at 15.00 in GVC Hörsalen. If you want to bring a new poster, APECS Sweden pays for the printing costs. Register here to be included in the fika. Pub to be announced after the registration is closed.